Warriors Path is a state park located along Fort Patrick Henry Lake beside the Colonial Heights section of Kingsport. Pros: Location is one of the best things about the park. It’s just off Fort Henry Drive and only minutes away from almost anywhere in the city. There is great parking and you can choose to run on a paved no vehicles trail or you can run along the road. The trail around Duck Island is flat but if you want there are a couple of paths that go up a small hill. If you decide to cross the bridge and run on the road you can go back to the main gate, through the camp ground, by the marina or to the back entrance which is a steep climb. You can also use the park as a launching pad to run the community just outside of the back gate. Bonus-being a state park on a recreation lake means that the scenery is great! Cons: Almost all of the trails and roads are on the lake but as if it’s cold and blustery there is nothing to stop the wind until it gets to you. On a pretty day the place starts to get crowded and during the spring and summer the weekends and holidays are an early morning only option because the place gets packed. The Guest River Gorge is a walking/running/biking trail located within the Jefferson National Forest in between Coeburn and Dungannon, Virginia. Pros: The Gorge is easily one of the most beautiful trails I have ever tried to run. There is a paved access road and large parking area that never seems close to full. The trail itself is an old railroad track that has been repurposed and is a gravel/dirt surface. Unlike other such trails in the area like the Creeper Trail that in many places are deep and soft and at others narrow and rough the gorge is harder packed and wide. I have even seen wheelchairs used on it and it’s great to walk, run or bike on. There is a tunnel that it goes through close to the entrance and a trestle that offers unreal views of the river making it great for casual users as well as ones looking for a more challenging adventure. There are spectacular views of the river, plants, cliffs and even animals all along the way. The full length of the trail is listed as 5.8 miles but Garmin recorded it at between 5.4 and 5.6 and it is lined with benches throughout. Cons: The Gorge is best described as deceptively downhill and decidedly uphill. After you cross the trestle/bridge near the entrance the trail turns downward for the next 5 miles. There is no other official way onto the trail except the entrance so make sure that you take water and snacks as needed ( there is an unofficial way onto the bottom of the trail but it requires parking on a dirt road and walking a mile on an active railroad line). Enjoy the scenery on the way down, for me the way up is an exercise in determination on what my Garmin recorded as about 1,500 feet of climb that was almost constant. After the first two miles cell service becomes really spotty and finally drops so there is no communication. Finally, although it has excellent access from Virginia Rt. 72, it is a long drive for most people from the Tri-Cities. The Veterans Highway (Rt. 72) is the main road between Gate City and Ft. Blackmore and beyond to Route 71 near Gate City. Pros: Although it is only a two and sometimes three lane road there are lane wide shoulders that make it a safe place to run. There is a public parking area located in Ft. Blackmore just before the road narrows and becomes unsafe making that a great place to start but there are other wide spots and accesses located along the way. This makes running and walking here a customizable thing where you can chose between very challenging and moderately rolling. The scenery is awesome all along the way and there is the actual memorial located road side with a tank and markers honoring those who gave their life for our country. A bonus is the waves and honks of encouragement from passerbys as you go up steeper sections. Cons: Did I mention the steeper sections? I freely admit that I am fairly new to running but this is the second most challenging road I have attempted. Starting at Ft. Blackmore means a 2 mile 9 ½ % climb before you get a break. If you continue on there is a 10 % downhill and then back up you go. The Garmin shows a 10.4 mile round trip from Ft. BM to Midway Road has a 1,767 feet of climb and decent! If you continue on to Rt. 71 you will double the feet of climb and the mileage. The greenbelt runs roughly parallel to Stone Drive in Kingsport and is a multi use trail for walkers, bikers and runners. Pros: The greenbelt is almost entirely paved and has multiple access points from end to end. It is listed as eight miles long making the Stonebrook Place parking area roughly the halfway point while the parking lot behind Pet Smart is the most popular access. Because of the length and the geography it is easier to think of it as west end, center and east end. The east has the only real challenging climb which is also the only unpaved section. The center section is mainly flat but somewhat winding while the west end is fairly flat with a few small climbs and straight. It is handicap accessible, has some scenic areas and there are several benches along the way. Perhaps the best thing about the greenbelt is that you can access several neighborhoods along the trail which allows for infinite variety. There are even some water fountains and portable toilets. Cons: The biggest drawback to the greenbelt is the poor drainage on much of it. When it rains or snows several places become muddy and difficult to pass through and sometimes stays that way for several days. The Pet Smart access is also a popular duck and goose feeding area so they tend to run towards you thinking you have food. After passing Holston Valley Medical Center heading west there is a section that follows the roads and it is not marked well making it hard to find the path as it leaves the roads again if you do not know the way. There is another part on the western end where the greenbelt ends abruptly at a parking lot and is found on a back street on the other side. This makes the Netherland Inn section seem like it’s a short section that is not really part of the whole belt and the area between there and Holston Valley is largely unused because few know it exist. Big Stone has one of the nicest places to run in town of any place in the local area. The East end of the Greenbelt starts at Bullet Park which offers great parking and has the added bonus (if the high school isn’t having a track meet or football game) of having a stadium to run and a track. The track, though boring, can be useful in working on pace and the stadium adds the element of stairs at the start, end or middle of a run. From the back of the stadium the belt runs past the two baseball fields and the tennis courts before exiting the park along the river. After a short run through the trees you pass by the softball field at Frog Level and then you come to perhaps one of the most unique things of any area running path. 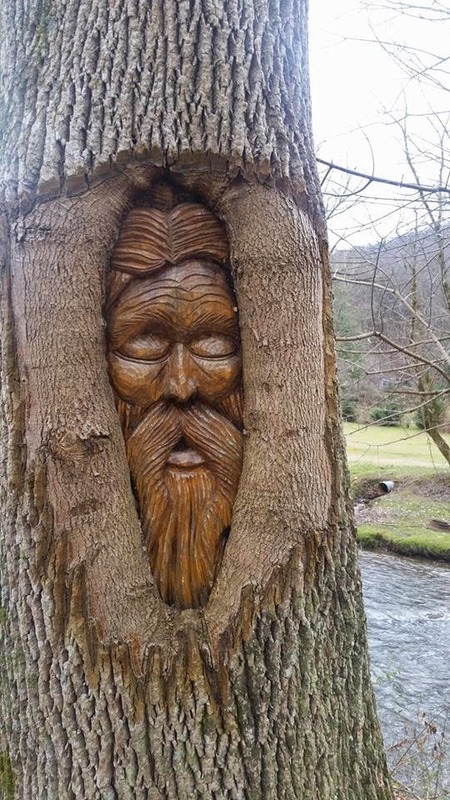 There are several living trees that have carvings in them to keep you company. As you turn back towards town you will pass soccer fields and town hall before you come to the end next to a car dealership. From there you can continue through the center of town with wide sidewalks and road shoulders back to the park or simply turn around and return the way you came. I have heard that there are plans to make the belt a complete loop but am unsure if this is true or of any time line. The pros of the greenbelt are that it is well maintained, it offers you the chance to be close to houses and roads without actually being on a road, there is a track and stadium to play with, there are multiple entry points including both ends, the sports fields and town hall and it is relatively flat. The cons are that it is short (2 1/2 miles or so), has limited areas that you can safely run or bike beyond that are attached to it and during high school and little league events one portion of it limited.